Singapore, officially the Republic of Singapore, is an island nation located at the southern tip of the Malay Peninsula. It is one of the few remaining city-states in the world and the smallest country in Southeast Asia. Since independence, Singapore’s standard of living has risen dramatically. Singapore has been rated as the most business-friendly economy in the world, with thousands of foreign expatriates working in multi-national corporations. 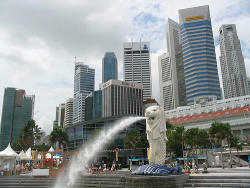 Singapore is a popular travel destination, making tourism one of its largest industries. At first glance, Singapore appears shockingly modern and anonymous, but this is an undeniably Asian city where Chinese, Malay and India traditions from feng shui to ancestor worship create part of the everyday landscape-colorful contrasts that bring the city to life. Singapore was founded as a British trading colony in 1819. It joined the Malaysian Federation in 1963 but separated two years later and became independent. Singapore subsequently became one of the world’s most prosperous countries with strong international trading links (its port is one of the world busiest in terms of tonnage handled) and with per capita GDP equal to that of the leading nations of Western Europe. Singapore has a highly-developed and successful free-market economy. It enjoys a remarkably open and corruption-free environment, stable prices, and a per capita GDP equal to that of the four largest West European countries. The economy depends heavily on exports, particularly in consumer electronics and information technology products. It was hard hit from 2001-03 by the global recession, by the slump in the technology sector, and by an outbreak of Severe Acute Respiratory Syndrome (SARS) in 2003, which curbed tourism and consumer spending. Fiscal stimulus, low interest rates, a surge in exports, and internal flexibility led to vigorous growth in 2004-06 with real GDP growth averaging 7% annually. Singapore consists of 63 islands, including the main island itself. The urban area used to only be concentrated on the south of Singapore, around the mouth of the Singapore River and what is now the Downtown Core, while the rest of the land was undeveloped tropical rainforest or used for agriculture. Since the 1960s, the government has constructed new residential towns in outlying areas, resulting in an entirely built-up urban landscape. Singapore has a tropical rainforest climate with no distinct seasons. Its climate is characterized by uniform temperature and pressure, high humidity, and abundant rainfall. Temperatures range from 22°C to 34 °C. June and July are the hottest months, while November and December make up the wetter monsoon season. About 23% of Singapore’s land area consists of forest and nature reserves. Urbanization has eliminated many areas of former primary rainforest, with the only remaining area of primary rainforest being Bukit Timah Nature Reserve. Singapore is a mixture of an indigenous Malay population with a third generation Chinese majority, as well as Indian and Arab immigrants with some intermarriages. There are very few people in Singapore who can claim to be truly indigenous to the island of Singapore and they are basically descendants of immigrants who came to Singapore to take advantage of the economic opportunities. Since the 1990s, the government has been striving to promote Singapore as a center for arts and culture, and to transform the country into a cosmopolitan ‘gateway between the East and West’. Singapore is a multi-religious country, the roots of which can be traced to its strategic location; after its declaration as a port, a wide variety of nationalities and ethnicities from places as far as Arabia immigrated to Singapore. In 2000 the Parliament of Singapore passed the Compulsory Education Act, which codified compulsory education for children of elementary school age, and made it a criminal offense if parents fail to enroll their children in school and ensure their regular attendance. In Singapore, the English language is the first language learned by half the children by the time they reach preschool age and becomes the primary medium of instruction by the time they reach primary school. English is the language of instruction for most subjects, especially mathematics and the natural sciences. Both Special and Express are four-year courses leading up to a Singapore-Cambridge General Certificate of Education Ordinary-level (O-level) exam. The difference between Special and Express is that the former’s native languages — English and the mother tongue — are taught at a higher level as Higher Mother Tongue, and are thus more difficult. Normal is a four-year course leading up to a Normal-level (N-level) exam, with the possibility of a fifth year followed by an O-level. Normal is split into Normal (Academic) and Normal (Technical). In Normal (Technical) students take subjects more technical in nature, such as Design and Technology, while in Normal (Academic) students are prepared to take the O-level exam and normally take subjects such as Principles of Accounting. Most schools commonly follow the kind of grading system awarded at the Singapore-Cambridge GCE “O” level examination, for which a student sits for at the end of four or five years of secondary education, sitting for at least 6 subjects. The level of achievement in each subject is indicated by the grade obtained, with A1 being the highest achievable grade and F9 the lowest. Upon completion of the 4 or 5-year secondary school education, students will participate in the annual Singaporean GCE ‘O’ Level, which will then determine their aptitude and the pre-universities or post-secondary institutions they are able to be admitted into. Pre-university centers include junior colleges for a two-year course leading up to GCE ‘A’ level, or Millennia institute for a three-year course leading up to GCE ‘A’ level. The pre-university centers of Singapore consists of 17 Junior Colleges (JCs) and a Centralized Institute (CI), the Millennia Institute (MI, established 2004). The pre-university centers are designed for upper stream students (roughly the top 20%-25% of the cohort) who wish to pursue a university degree after two to three years of pre-university education, rather than stopping after polytechnic post-secondary education. The two-year Junior College program has become the norm for students pursuing university education. Junior college has become synonymous to prestigious education. Junior Colleges (JCs) accept students based on their GCE “O” Level results; an L1R5 score of less than or equals to 20 points must be attained for a student to gain admission. JCs provide a 2-year course leading up to the Singapore-Cambridge GCE Advanced Level (“A” level) examination. Centralised Institutes (CIs) accept students based on their GCE “O” Level results; an L1B5 score of less than or equals to 20 points must be attained for a student to gain admission. Millennia Institute, provides a 3-year course leading up to the A-level examinations. Polytechnics in Singapore provide 3-year diploma courses and, they accept students based on their GCE “O” level, GCE “A” level or Institute of Technical Education (ITE) results. Graduates of polytechnics with good grades can continue to pursue further tertiary education at the universities, and many overseas universities, notably those in Australia, give exemptions for modules completed in Polytechnic. The Institute of Technical Education (ITE) accepts students based on their GCE “O” level or GCE “N” level results and they provide 2-year courses leading to a locally recognized “National ITE Certificate.” There are 10 ITE Colleges in Singapore. A number of ITE graduates are doing considerably well in the workforce as they are equipped with essential skills in their various fields of study and are proficient at their jobs. Some ITE graduates continue their education at polytechnics and universities. There are currently four universities in Singapore. The two public universities National University of Singapore and Nanyang Technological University each has more than 20,000 students and they provide a wide range of undergraduate and postgraduate degree programmes including doctoral degrees. Both are also established research universities with thousands of research staff and graduate students. A third university Singapore Management University (SMU) opened in 2000 focusing on business and management courses. Although it is a private university, it is funded by the government. The forth university, privately-run SIM University (UniSIM), opened in 2006. In addition, there are more than ten other private tertiary institutions offering undergraduate and postgraduate degrees. The government has announced plans to set up a fourth public university.